for February 22nd are Luminous. about love in your hearts. status of my Immaculate Heart. with love to carry Jesus. you because of this love? to be so loved by God. story of love for you. brothers who need my message? when you are angry and hateful. 1. Jesus: How is it in your family, My beloved shepherds? How is it in your world? Are you rejected by those at work? Do you feel as if you are alone? For I was alone in the garden and My Apostles, they slept. They did not come to comfort Me. How do you feel since you have become a shepherd? How is it? Your children, have they abandon you? Do you know that you are not alone? Although you may feel alone, but the world is not like you. For the world has made the devil their god. I am not like the world and you are not like the world. So therefore, you feel estranged from the world. You feel separated. You feel isolated. And you go to the top of the mountain and you go to Mass, and you are raised to the highest heights in Me. And you go out and the world is oh so different than what you have experienced in the Mass. I have given to you, My shepherds, the greatest grace, and I speak to you. R. I feel so close to the Father. For in this Movement, since the beginning of the Blue Book messages, I learned to know and to love Jesus. I know I was close to the Holy Spirit, and I know that I learned to grow in the greatest intimacy with Jesus. But ever since that Father’s message in January of 1997, this oneness of living in Him in Jesus has been so great in my life in realizing my oneness with the Father, that when we pray it, it makes me cry sometimes because I love Him so much. This is what He has done. We have been given this great intimacy with the Father by knowing Jesus. R. That’s what I just keep seeing, always referring back to the One that sent Him. R. This is what we are here for - to put forth the truth, to testify to the Word of God that the truth will be brought forth in all of our dealings. This is the Shepherds of Christ Movement - to always operate in the truth according to the Word and the commandments. the Spirit of truth who issues from the Father, he will be my witness. And you too will be witnesses, because you have been with me from the beginning. R. When the tabernacles are moved, when people do not realize what God is truly saying in His Word, when we realize that He wants to be loved, when we realize the great gift that is in the Mass and we speak about it, we are testifying to the truth that God is alive and truly present, the King of all kings, the King of Glory, Our Lord, Jesus Christ. Mary: I have come to you, my little children. For I am Mary, your Mother and I come to you on this 13th with a special message. I know the grief in your own hearts for your children that have gone their way. But do you know the grief in my heart as I stood beneath the cross and I cried for my little children of this world that would lose their souls despite my Son and His suffering? I feel the pain for the children of this earth, my little children. How is it with your own children? Do you understand as your Mother that I appear on the building in Florida, the Lady clothed as the sun to lead the children to the Light? He is the Light of the world, my Son, Jesus. He comes to lead the light home and they do not know for they have plugged up their ears and they will not listen and they are blind, blind and dense. Do you know what it is to be blind that you do not see? Let us think about blindness at this moment, my children. The blind man does not see. This is how it is for so many. For they will not look beyond. They give themselves messages in their hearts that they are right when they do their own wills and they tell them, many religious people, that they are doing the will of the Father. There are so many on this earth that are blind. Will you lead them to the Light? For in a moment, they can be given a grace and the sky opens up and with the light of seven suns, you see with the greatest clarity the insights into the mystery of God. And you think and you think and you think; it is not in the heads! It is in the hearts! My children, I ask you to lead the souls of this earth into the Heart of my Son, Jesus. For it is there that they will know Him most intimately in His Word. It is so sad, for they are so willful; they will not listen to me. For I told them at Fatima and they ignored the message that I gave to them, my little children of the earth, and how they will suffer soon, for they did not listen to me when I warned them. And I appear now, Mary, your Mother, the Lady clothed as the sun, to lead the children to the Light - my Son, Jesus. I ask you, again, to make all attempts to secure the building in Florida to lead the children to the Light. I am the Lady clothed with the sun and behind my image, I wish the exposed Eucharist, my Son, Jesus. I give to you Jesus, the Light of the world. Mary: I am Mary, your Mother and I speak to you, my children of light. R. This is our mission in the Shepherds of Christ - to live in the truth. This is why Our Lord is so strong in what we do. We have a special mission from God to help to renew the Church and the world. It is a mission given to us as lay apostles. You can be an associate. You do not have to be a lay apostle. But it is to the lay apostles that He will speak so frequently in these rosaries. And it is this issue that I address. Why the seriousness? Why the harshness? Why? What we are given the mission to help to renew the Church and the world in truth. He wants us using this material. For He is teaching us about our mission. The Franciscans follow the Franciscan format. There are directions. They do not go to the Jesuits and the Poor Clares and all the other religious organizations. This is a most directed mission given by Our Lord to help to bring the world into one fold. He is the Good Shepherd giving His word to lead the flocks into oneness. Our mission is oneness. It is oneness to which I speak. It is oneness to which I know from the experiences He has given to me in the Mass. January the 20th and the 21st of 1996, from that point on, it is great suffering to have division in our presence. You feel this. You have grown more one and one in Him in this consecration. We consecrate our hearts all through the day. We go more and more into this oneness. And when there is division it is tremendous suffering to be there, for our hearts are in Him and He wants oneness. Our whole goal is to be one with the Trinity. Our goal is eternal happiness in heaven! It is oneness that we seek. We are going more and more into His Heart. We know oneness in Him. Division bothers us tremendously. Our families are divided. Our workplaces are divided. Our Churches are divided. Our world is divided. And so we live in our little cocoon, the Shepherds of Christ. But we must love those that we are divided with, for God loves all. And it is in this love of all, despite the division, that we will have the fullness of life in Him. R. But He says, ‘Do not work for food that perishes but for the food that endures for eternal life.’ And He says He gave them bread from heaven to eat. R. And how do we see the Son? We see the Son by knowing Him not with earthly vision but with the eyes of faith. The more we give our hearts to the Hearts of Jesus and Mary, the more we know God. It is in His Heart. He says over and over again in these messages that He has most intimately revealed Himself to us. And look what they did with His Blue Book messages, the ones that would lead to the Eucharist, all the things they did. He is revealing Himself for this great age in which men will be fed with the Bread of Life, that is the Eucharist and the Word of God. 2. R. This is from the beginning of the first Blue Book and He told me to write this. All of us possess everything we need to have an intimate union with Him. He has written to me since October of 1991. For at least a year I sat in front of the tabernacle and begged him to talk to me. R. Adam and Eve were in the garden, but they disobeyed God. R. How many are locked in the tomb of darkness within their hearts? 6. R. And so how is it with you? Do you stand by the tree and you feel as if you are holding on for dear life? And many times you are pressed on, pressed on, and so many things seem as if they are arranged to just test you and you are holding on and holding on. And it feels as if God is so far away, when in fact, that great suffering, He is so close. For He stood by the tree. He was hung on the tree to His death on the cross, and it is in that death that we have been able to share in this great life that He gives to us in the resurrection. Is not our life to be modeled after His life? 7. R. I felt as if I could not go on and there it was before me, the glorious clearing through the forest and I saw the light. We see so many things with earthly vision and He is an infinite mystery. We are so earthy and He is heavenly. He has taken us into the depth of His Heart and He has revealed Himself most intimately to us, majorly through the consecration, through these writings, and in this Movement. And we know Him in His word. They were saying something about Jesus and they said, “How does He know all this? He didn’t study scriptures.” How do I know all this? I didn’t study scriptures. I was a math teacher. But He has revealed Himself in these writings and you open up the Word and it’s like, “Ohhh man!” It all comes alive. From living in Him, we know Him most intimately. This is His Word. To know Jesus Christ is to know His Word. He is the Word. So to know Him most intimately is to know the Word. 1. R. This is from a book that Fr. Carter wrote sometime in the ‘80’s, but He uses it to teach from all of his classes. And when Fr. Carter writes, it’s like the writings that Jesus gives to us. It has all this depth to it. We live in Him. We know it in greater depth as we live in Him. So it’s like the word ‘Father,’ the more I grow in my love relationship with Him, the word ‘Father’ just keeps getting more and more depth. So the more that we grow in maturity in our relationship with God, the more every word is to be savored and experienced deeply in our heart. For the Word is a love affair with God. I want to go deeper and deeper into His Heart. And in the writings of Fr. Carter, you’ll see that depth in the Divine Mind who is the author of his writings, the infinitude into the Divine mystery. So this is like at the beginning of this book. At the destined moment in human history, God’s selfexpression, the Word, immersed himself into man’s world. God’s inner self-expression now had also become God’s outer self-expression. Consequently, the mystery of God becomes the mystery of Christ. In Christ, God tells us about himself, about his inner life, about his plan of creation and redemption. He tells us how Father, Son, and Holy Spirit desire to dwell within us in the most intimate fashion, how they wish to share with us their own life through grace. All this he has accomplished and does accomplish through Christ. St. Paul tells us: “I became a minister of this Church through the commission God gave me to preach among you his word in its fullness, that mystery hidden from ages and generations past but now revealed to his holy ones. God has willed to make known to them the glory beyond price which this mystery brings to the Gentiles—the mystery of Christ in you, your hope of glory. This is the Christ we proclaim while we admonish all men and teach them in the full measure of wisdom, hoping to make every man complete in Christ” (Col 1:25-28). Jesus: What I reveal to you here, I do in your heart. My connectedness to you is in your heart. I do not need the senses. Man wants God to be like them. Do not ask to have God explained in human terms. This, My child, is surely in the realm of the spirit. Things of God are not like the things of man. I communicate to you as I am. Others want you to explain to them just how it is. Jesus: I am this personal to you, but My ways are not your ways and, though I try to make you understand some of the mystery, you cannot in your humanness explain the ways of God. Go ahead and try, child. It is a waste of your time. Do not ask My messengers for explanations that you will understand. You will not ever on this earth understand any of what is happening here. My ways are the ways of God. What is happening here is a miracle. 5. R. And He ends the book with the same thing that I began it with which I was told to do, which I never knew this, He just told me to keep reading. 7. Jesus: Sit at your desk and scratch your head, My beloved ones. For you will only know when I give a great grace to understand. I communicate to you in your heart. R. God talks to each of us inside of our hearts. There is an open pipe line between us and Him. The inner prompting felt in our hearts are the way God is speaking to us right now. He does not need our senses to talk to us. We take in our earthly knowledge through our eyes and ears. We communicate with each other through our senses, but God does not need senses. He communicates directly to each of our hearts. And so, I went to Communion and God did not speak to me in words. I was overwhelmed with the presence of God, the Father, the Son, and the Holy Spirit, and He was so one in the most intimate union. And I was awestruck and taken to the heights of heaven and I knew Him most intimately. Not in words did He speak to me but in my heart. I was one in the deepest ecstasy with my Almighty God. 8. R. And so how did He suffer when they pounded the thorns into His head? But the great suffering was not the thorns that poked His head and made Him bleed, but the suffering was in the haughtiness in the minds of men to think that they know it all and will not listen - the Lady of Fatima who tells us that we must consecrate our hearts. The Word will be born in their hearts. It will come forth and men will know God most intimately when they give their hearts to the Virgin Mary. And the Holy Spirit works and she places them into the Heart of her beloved Son. For this is what happens to me all through the Mass. I am there in the pew and I pray for the grace. But He has asked me to write a book, The Spouse of the Lamb. And you were there and you could be having a dark day, but with your whole heart, you want the Bridegroom to come with His great grace and to make Himself known to you. And He, indeed, is the Initiator, for in a second, He comes and you are overwhelmed with the presence of God. And now I see the Bridegroom of my soul. The priest is to be so one with Christ to teach us how to be the spouse of the Lamb. He is calling a priesthood in the Shepherds of Christ that we will have priests for the new earth that will teach the souls how to be the spouse of the Lamb in the most intimate union. And He gave Himself to me and I was taken to the heights of heaven. And in that embrace of the Divine God, in knowing Him most intimately, not in words and in senses and in seeing and in hearing and whatever, in the heart. In being embraced by God and saturated with His Divine life, the presence of God overtook my soul. 9. R. But what happened in that moment is the realization that in every person, in the priest, Christ can be so alive in them. And as we unite in oneness with each other, Christ comes alive in our hearts. And so He tells us to love God and to love one another and I come to sit there in front of the tabernacle as I had to, to receive the beginning Blue Books for those hours. It was more and more the spousal relationship between the soul and the Lamb in love of God and in love of all others. There cannot be division in our hearts for others. And our children, is it not our responsibility to correct our children and to tell them what they need to know to live in Him? Is it not our responsibility? We must live in the truth. It is not up to me in the Shepherds of Christ Movement to go out and to stand there and to argue with people and say, “This is the truth,” when somebody is not open. We are to feed, He says, the hungry. Our egos get in there. Here’s somebody and all the stuff comes in there when you have been pressed back and you’re going to convince them. That’s not what He’s talking about. He’s talking about feeding the hungry, not feeding our egos because we’ve accomplished something with somebody that’s hard as a rock, because satan gets in there and you’re arguing with them. Let us feed the hungry with His Word and telling them about Christ truly present in the Holy Eucharist. Feed them with the Bread of Life. 10. Jesus: My beloved ones, I speak to you and I tell you this. I have called you as lay apostles in the Shepherds of Christ Movement. You are Apostles of My Sacred Heart. You go to your homes. You live by the messages that I have given to you. For this mission, I ask you, to restrict your reading to the material that I have given to My messengers, Fr. 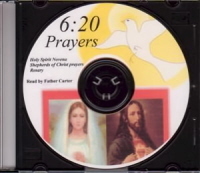 Carter and to Rita, to help to bring the Reign of the Sacred Heart. Stay focused on this Mission. 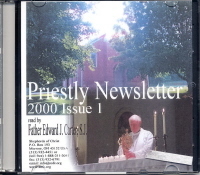 I am asking you to read the Word and the Catechism and information that is approved by Fr. Carter. The time is very short for this mission. You must be trained as My apostles to help to bring about this new era in which there will be one flock and one Shepherd. It is oneness that you will help to accomplish the goal of the prayer that I said to My Father. This is a main mission for the Shepherds of Christ Movement to help to bring the Church and the world into oneness. There must be purity in your Movement, strict adherence to the truth. I am asking you to obey these messages and to stick to these messages. There will be many messages that will lead many astray. I am asking you to study the Apostles’ Manual. This is the mission that I give to you if you wish to be a lay apostle in the Shepherds of Christ Movement. If you do not wish to be a lay apostle in the Shepherds of Christ Movement, you can be an associate in this Movement. But the more you focus on this material as an associate, the more you will hear the voice that the Good Shepherd speaks to you in the messages to accomplish this mission. I am Jesus, Chief Shepherd of the flock. I come to separate the sheep from the goats. I am asking you to help to spread the light in the darkness. 2. Jesus: I have attempted to purify your Movement. I have attempted to separate the sheep from the goats. There are many that are willful and are not living in obedience to the messages. It is most important that you live by the messages that the Reign of My Sacred Heart will come about on this earth. I am asking you to be a Shepherds of Christ lay apostle, a handmaid, a priest, for the Shepherds of Christ Movement. I have called you here. This is the intention of the Good Shepherd to help to bring about the renewal of the Church and the world. If you do not wish to join, then I am asking you to be an associate and to pledge your loyalty by recitation of the prayers as often as possible and living as much as possible to the requirements for lay apostles. I am not forcing you, My beloved ones. I have called you this day to purify your life. I have called you to service. It may be, at this time, that you feel you can recite the prayers and begin to live by the Blue Book messages or it may be that you are a full-fledged lay apostle, handmaid, or priest. It is at this time that you know what I am speaking to you in your heart. 3. R. This is a message from Jesus that I received today. 4. R. This is from the Father’s message. I think it is January the 18th and I’ll just read this. This was one of my letters after Communion. God the Father: My Son has revealed Himself as never before in history into His tremendous love for men and you treat Our gift with such indifference. 9. R. This is These Forty Days of Lent. R. This is like the whole thing is our participation in the Mass is like the most important. 6. R. This is from the book, The Spouse of the Lamb, March the 11th, 1998. It’s around the 15th or 16th entry. R. My beloved Spouse, since the beginning of Lent, I have experienced Him as the Man in black, as the Bridegroom. Today, as never before, I have experienced His body. A real man offered sacrifice that Holy Thursday. I saw His body on the cross as I did on December the 5th, 1996 - a real body of a man. And I recalled another time, I think it was on Friday in Lent, when I experienced Him dead on the cross at St. Vincent’s, or almost dead. His mouth may have been moving then. I know I have experienced Him at the point of death three times at St. Vincent’s. I have had other experiences with Him dead or at the point of death on the cross there. So to see Him on December the 5th, 1996, was to dig into an already open wound from before and I could not hardly stand it because it was so vivid, Jesus, life-size, before me. What I experience mostly in this Mass was His humanity. In great joy of the immense revelation, I realized He had a flesh body, arms of flesh. I used to see Him give me Himself as the Jesus on the front of the Apostles’ Manual and it made me cry. I would see His glorified wounds and know Him this way and love Him. Now, since Lent, I see Him as a Man with a body and flesh. He is the celebrant of the Mass. He is the sacrifice. I am aware of a Man in a black suit, a Bridegroom. I experienced the Divine Lord. I know Him. I love Him. But to see Him in the body of a man offering Mass and dying for me makes Him so real. So I cried. I see the Lamb of God. He is Jesus. Jesus was a real man. Jesus was alive like me and He talked and He walked and He called to others. This has touched me to great tears. I heard, “Lamb of God, who takes away the sins of the world, have mercy on us.” I received His Body, His Blood. I received the Savior of the world. When I see Jesus, celebrating the Mass through the priest, Jesus goes into the priest and I realize He is here this day in the priest. Such an honor to be a priest celebrating the Holy Sacrifice of the Mass. My intense suffering to want Him so much, now becomes greatly lessened because I see Him with us this day acting through a priest. He is so present. He is not far off. He is with us today. I had an experience of the crucifixion today. I experienced being there. It was being there. I was removed from my surroundings and in immense peace. 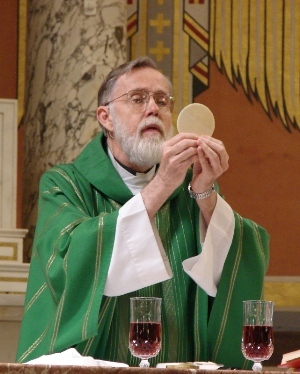 When I received Him in the Eucharist, I could hardly stand it. R. Oh Jesus, He took me to the heights of ecstasy in Him in realizing how He is the Initiator and acts on my soul. How foolish I am indeed to think it is I who control the workings of God on my soul, when in fact He is the Bridegroom of my soul. I see Him look at me with the greatest love, as I did once in the study, when I knew He looked at me and loved me so. I sat with a white dress and my Bridegroom looked with love on me, thinking me so beautiful to Him, me the little child of the Father in all my faults, and looking on me with such love. He stood above me as a Bridegroom dressed in black, tall and handsome, and He looked down with the most loving eyes upon me and I knew the love of the Divine Creator. Today I knew how it was, how He acted on my soul. I see how it is when someone really acts in love and does something for me because that person loves me. I see myself as open, letting go, putting myself entirely in the hands of the Creator, the God I love, and the Bridegroom comes with the greatest love and His grace. He gives me Himself. My job is to be, just to be, a soul, waiting for the Bridegroom to just give me Himself in the greatest love. I am, I know it is He who acts, and when He acts His presence overtakes my soul. I am, I let go and I reminisce about all the times He just overtook my soul. And what My child is the key, but total surrender as a spouse who knows her spouse loves her and takes the love given. You, child, pray for this grace, to be possessed by the Lamb, the Bridegroom of your soul. What lesson did I teach you this day but that it is I who act upon you, you do not control My love given to you in any way. A grace is given, a grace is received. Your total surrender is the way to most optimally allow the Bridegroom, the Lamb, to act on your soul. Jesus: My child, I act, you are passive, empty and open. Surrender and I will possess your soul with the lights of heaven so you can experience your Divine Lover most intimately. Surrender, surrender, surrender, a state of being and surrender to live in Him at the point of greatest intimacy in the Mass. You will know days of darkness and joy as the shadows and lights fade in and out of your life and I reveal Myself most intimately to you. R. It just goes on and on, but they talk about the Bridegroom, waiting for the Bridegroom, and there are foolish virgins. And this is really the age when people will know the Bridegroom of their soul and now they’re like the people down below the mountain with Moses that were worshiping the molten calf cause he took so long. Anyway, that’s all for this Hail Mary. Look, he is coming on the clouds; everyone will see him, even those who pierced him, and all the races of the earth will mourn over him. 10. Jesus: My beloved ones, I am coming to you. I am coming soon. For the world will know Me. They will see as never before. They will remove the mud from their eyes and they will have clear vision, for they will know Me in their hearts and men will fall to their faces. It is now as if your earth is asleep, but they will see soon with the light of seven suns. And the light is slowly stealing across the sky as you spread the consecration. I give to you, My beloved shepherds, the Shepherds of Christ Movement that the world will be made into one flock with one Shepherd living in My Heart. I am Jesus, Chief Shepherd of the flock. R. And He will put all authority under His feet.